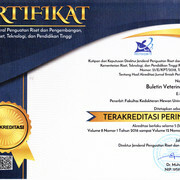 Buletin Veteriner Udayana contains scientific papers in the field Kedoteran and Animal Husbandry, in the form of research, articles pillowcase reverse (review). Manuscripts / papers must be original and unpublished. If accepted for publication in the Bulletin of the Veterinary Udayana, then it should not be published in magazines or other media. Scientific manuscripts printed using A4 paper. Spaced manuscript using a word processing program Word for Windows, font Times New Romanfont size 12. Procedure scriptwriting research results should be arranged in the following order: Title, The identity of the author, Abstract, Introduction, Methods, Results and Discussion, Conclusions and Recommendations, Acknowledgments and Bibliography. Strive printed in black and white, and the full text of no more no less than 10-15 pages. Identity author: name written in full (not abbreviated) without a degree. When the author of more than one, with addresses, different agencies, then behind every name given an index of Arabic numerals. Address of the author written under the name of the author include laboratories, institutes, and complete address with telephone number / fax and e-mail. Additional indexes given to authors who could be invited to correspond (corresponding author). Abstract: Written in Indonesian and English beforehand when the script in Indonesian, and vice versa.Abstract include keywords (key words)ordered by importance. Abstract summarizes the manuscript, without trying to cover the entire article detailing every part. Avoid using abbreviations. Introduction: Loading of the scope, objectives and benefits of background research. This section should provide the background so that readers can understand and assess the results of research without reading the previous reports relating to the topic. Make use of the library to support the discussion. Methods: It should be as detailed and clear about the materials used and the way work is carried out, including statistical methods. How it works submitted should contain sufficient information to enable the study can be repeated successfully. Results and Discussion: Presented jointly and clearly discuss research results. The results of the research can be presented in written form in the text, tables, or images. Reduce the use of charts if it can be explained in the text. Limit the use of photographs, presenting a clear picture illustrates the results obtained. Figures and tables must be numbered and cited in the text. The discussion presented should contain the interpretation of the results obtained and discussion relating to previous reports. Either avoid repeating the statement that has been delivered to the methods, results and other information that has been presented in the introduction. Conclusions and Recommendations: Presented separately from the results and discussion. Acknowledgements: Can be served if it is deemed necessary. Addressed to fund research and to reward institutions and individuals who have helped the research or the writing process. Bibliography: Organized alphabetically by name and year of publication. Abbreviations magazine / journal based procedures that can be used by each journal. The proportion of bibliography journals / scientific magazines at least 80%, and the text book20%. Cowle SM, Horae S, Mosselman S, Parker MG. 1997. Estrogen receptor alpha and beta form heterodimes on DNA. J Biol Chem, 272: 158-162. Bebas W, Budiasa MK.2009. Pengaruh penyuntikan oksitosin sebelum inseminasi pada babi terhadap persentase kebuntingan dan jumlah anak per kelahiran. J Bul Vet Udayana, 1(1): 1-5. Lukert PD, Saif YM. 1997. Infectious bursal disease. In: Diesease of Pultry, 10th ed. Calnek BW, Barness HJ, Beard CW, McDaugrad LR, Saif YM. (eds). Iowa State University Press, Ames, Iowa, USA. Pp. 721-738. Muzzarelli R. 1990. Chitin and chitosan: Unique cationic polysaccharides, In : Proceeding Sympotium Towards a Carbohydrate Based Chemistry. Ames, France, 23-26 Oct. 1989. Pp. 199-231. Against manuscripts / papers sent, the editor reserves the right to: load script / papers without repair, load the manuscript / paper with the repair, refuse manuscripts / papers. All editorial decisions will be final and no correspondence held for that purpose. Every manuscript sent to the editor for publication in the Bulletin of the Veterinary Udayana be regarded as original works of authors and if received, the manuscript was not allowed to be published again in whole or in part without the permission of the Buletin Veteriner Udayana.